The Palm Oil is not pure and clean looking it is real, real life, real oil and made in a natural and organic way. 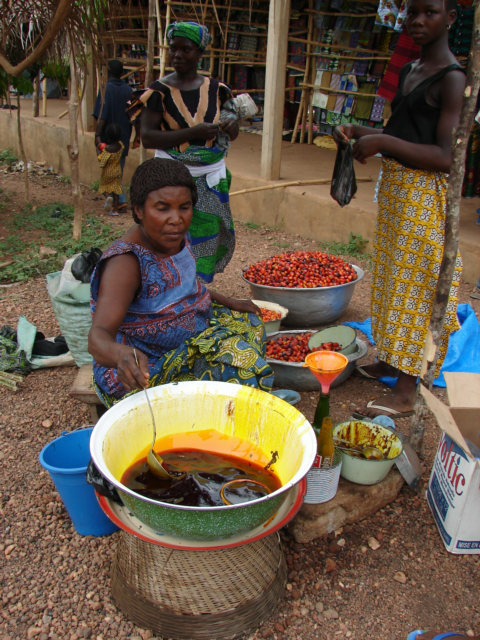 This is a photo I took in the market of Kpalime; the woman is selling palm tree oil, squeezed from this small little nut like thing. It is not the coconut, it is something that hangs down, not clear myself and there is nobody here in the organic natural and authentic world that cares to explain in English. I think I could get a very good Mina language explanation. They do need and want to use the oil though, they are practical and use what they need, not making all the political correct decisions. 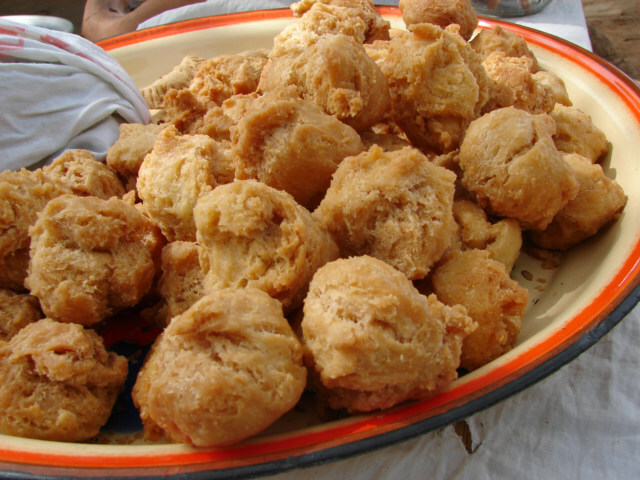 I see yams or cassava mostly being cooked in oil, there is also the Gateau I eat in the morning. They deep-fry them over a wood flame while I wait. I like the Gateau or the round, what I think is corn, with some sugar inside dough thing, deep fried, and sold like a round donut hole, but is not a donut hole. Hmmm.. I have a photo. Yes, the cheap food, I eat in the morning, one of these costs 25 Franc and one dollar is 500 Francs. I like them, and I have a small chat Chantelle, not Chantilly Lace, but Chantelle is my new friend, I think her mother makes them. Chantelle is married, has a baby by the name of Rose, and is nice, speak no English, small French, however we do communicate. I am doing this mostly to EAT in the world now, IF I can see them cooking it, I will eat it, if they are not cooking it in front of me, I do not eat it, my solution to eating healthy. I see many a chicken here looking like it is being cooked, and I want to see how long it has been on the burner, or is it from yesterday. I truly believe restaurants of the planet, take foods that did not sell yesterday, or the day before and just keep putting them out to sell. Not so bad when you know they have a fridge, sense of what is safe, and has the basic idea understood. NOT! I trust my mom for this, and after that, I do not trust anyone, the world is about making a buck and the world will sell me anything they can get away from and I do not care if a 5 star hotel or the street vender. I am getting vigilant, cook it in front of me, and I will eat it. Organically grown, a great marketing plan, a semi-good idea that goes astray, turns into a way to sell food at very high prices and who can say, was it really organically grown. The foods I see grown naturally grown are very ugly, I eat them daily, and the bananas are difficult to buy. Is the world really ready for the ugly truth, would they eat meat, if they had to kill the chicken. The normal world will kill the chicken, we are sanitized and three levels away from life, the real world is a little too real for most people anymore to understand and appreciate. I would wretch the necks a couple of chickens, if I thought they had some meat on them bones. They got some of the skinniest chickens and range fed chickens, marathon-running chickens on the planet here. The meat is like eating leather, a great place to make a large chicken farm.